Indigenous languages once flourished in the United States. Now, they continue to account for a large portion of the nation’s linguistic diversity. It’s probably impossible to measure the true magnitude of indigenous culture and Native American languages that have been lost on this continent, but many organizations have tried. For instance, Greg Anderson, director of Living Tongues, told National Geographic in 2009 that only five language families exist in Oregon today — with most of them comprising only a handful of speakers — compared to 14 language families in Oregon 200 years ago. That’s more than all of Europe has combined, he added. “With the loss of the languages, all kinds of wonderful things that the speakers did with their languages have also vanished, for example, some of the greatest works of oral literature ever produced — the multilingual performances with different characters speaking different languages that was found in the Pacific Northwest,” Anderson said. The Columbia Encyclopedia cites a widely accepted estimate that there were more than 15 million speakers of over 2,000 indigenous languages spoken across the entire Western Hemisphere at the time of Christopher Columbus’ arrival. According to the Indigenous Language Institute, there were once more than 300 indigenous languages spoken in the United States, and approximately 175 remain today. They also estimate that without restoration efforts, there will be at most 20 still spoken in 2050. With all of that said, the movement to reclaim and preserve Native American languages has been underway since the Civil Rights era. But First: How Did We Get To This Point? The effect of European settlement was a deleterious one to Native American language and culture, to put it very mildly. By the middle of the 20th century, roughly two-thirds of all indigenous American languages (that’s counting North, Central and South America) had died out or were on the brink of extinction. North of Mexico, it’s estimated that roughly half of the Native American languages have become extinct, and of those still in use, more than half are spoken by fewer than 1,000 people. When Europeans first began to colonize the Americas in earnest, they brought diseases like smallpox and measles with them, as well as a settlement strategy that involved fighting and killing off Native Americans for their land. Their guns and horses gave them a major advantage — as did their immunity. Even the spread of disease, which is thought to have resulted in 75 to 90 percent of all Indian deaths, was not always an accident. Some settlers intentionally gave blankets to the natives that came from quarantined areas or infected patients. After hundreds of years of battles, wars and atrocities, including the systematic, state-sanctioned genocide of between 9,000 and 16,000 California Indians from 1846 to 1873, the condition of the Native American population was a shell of its former self. It’s estimated that between 1492 and 1900, the number of indigenous peoples living in U.S. territory dwindled from 10 million to less than 300,000. Of course, the extinction of various indigenous languages was more than just a mathematical consequence. Native Americans had been systematically removed from their ancestral lands over the years as the result of force and/or various treaties. They crowded onto increasingly remote and limited parcels of land known as reservations, and beginning in the 1860s and lasting through the early 20th century, they were also subjected to a program of forced cultural assimilation, carried out through government-mandated boarding schools. At these schools, children were forbidden from speaking their tribal languages, wearing their tribal clothing and observing native religions. 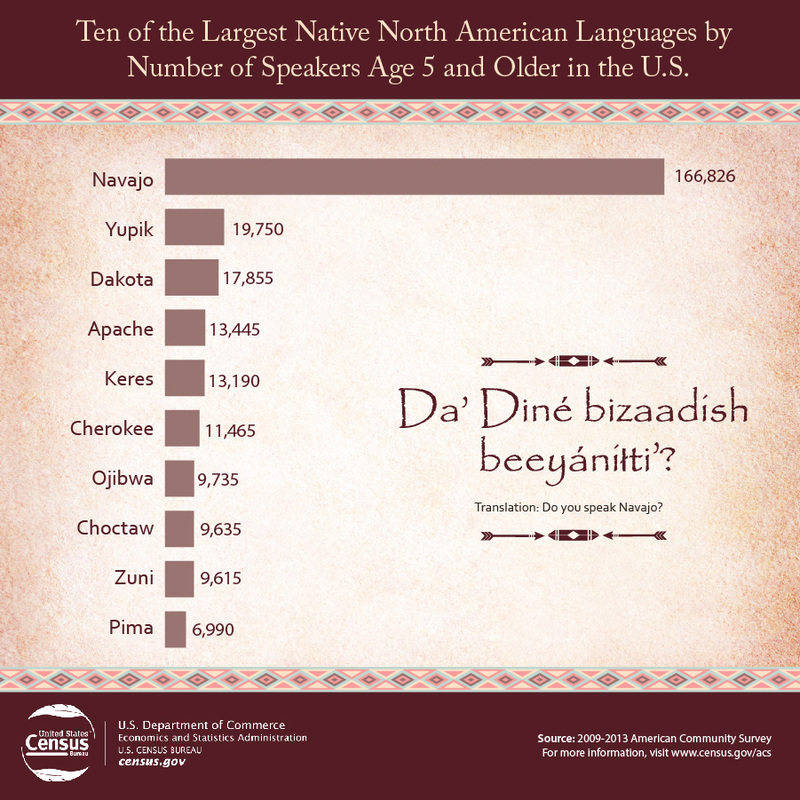 In spite of everything, there are still approximately 150 Native North American languages spoken in the United States today by more than 350,000 people, according to American Community Survey data collected from 2009 to 2013. That’s out of 350 total spoken languages in the country. Though most of these languages are on the verge of dying out, some are holding on. The Navajo language, for instance, is the most spoken Native American language today, with nearly 170,000 speakers. The next most common is Yupik, at 19,750, which is spoken in Alaska. However, the majority of Native Americans today speak only English. Of the roughly 2.7 million American Indians and Alaska Natives counted by the 2016 census, 73 percent of those aged 5 years or older spoke only English. That’s down slightly from 73.7 percent in 2005, though in 2010, that number had dipped to 72.2 percent. Today, the programs and initiatives aimed at preserving Native American languages are numerous, but this is the end result of a slow and arduous journey that involved various legal milestones and funding victories that worked to restore sovereignty to tribes. The challenges are manifold. For one, these are truly distinct languages we’re talking about. Contrary to common misconceptions, Native American languages didn’t originate from a single protolanguage, as the Indo-European family did. Additionally, many native languages relied on oral tradition, and many written texts were destroyed, so there are few existing records from before 1850. Still, many groups are undeterred. As one example, Native Languages of the Americas is a nonprofit “dedicated to the survival of Native American languages, particularly through the use of Internet technology.” Its website features a comprehensive collection of materials and online resources about Native American culture and language. Enduring Voices, a program of Living Tongues, has done things like provide the appropriate training and technology to the Winnemem Wintu, so they could compile video and audio recordings in their language. In 2010, Stony Brook University, together with two of the Indian nations, launched a joint project to revive Shinnecock and Unkechaug, two lost languages of Long Island’s tribes that hadn’t been spoken in nearly 200 years. Among their tools was a vocabulary list that Thomas Jefferson wrote in 1791. A 2009 article in The Guardian profiled a number of communities that were actively working to revive their languages, such as the Arapaho tribe in Wyoming, which set up a school dedicated to educating their children in their native language. Tribal colleges across the Great Lakes region were offering courses in Indian languages, and in Oklahoma, the Comanche Language and Cultural Preservation Committee developed a dictionary and language courses, as well as recordings of Comanche songs. The odds of restoring many of these languages to their former glory are certainly not favorable. But hope can be found in the smallest things: like CLCPC leader Ronald Red Elk’s account of a young Comanche girl whose first word was not “mother,” but “pia,” the native equivalent. When we speak languages, we keep them alive.